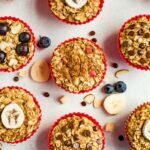 Keep these baked oatmeal cups in your fridge or freezer for an easy, healthy breakfast! There’s four different flavor options so you’ll never get bored. Vegan + gluten-free. In another bowl, whisk together almond milk, ground flaxseed and vanilla. Let sit for about 5 minutes before adding remaining wet ingredients which will vary based on which type of oatmeal cup you’re making. Add peanut butter, mashed bananas and 1/8 cup of mini chocolate chips into the bowl with the ground flaxseed and almond milk. Pour wet ingredients into the large bowl with the dry ingredients. Add extra cinnamon, almond butter, applesauce and 1/8 cup of diced apples into the bowl with the ground flaxseed and almond milk. Add almond butter, applesauce, almonds and 1/8 cup of blueberries into the bowl with the ground flaxseed and almond milk. Scoop mixture evenly into muffin tin with liners and top each cup with remaining blueberries and almonds. Add peanut butter and mashed bananas into the bowl with the ground flaxseed and almond milk. Scoop mixture evenly into muffin tin with liners and top each cup with banana slices, if using.